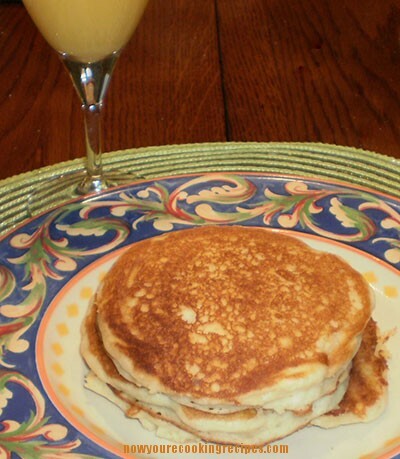 Gluten-Free Buttermilk Pancakes - Now....you're cooking! We like to treat ourselves to a big breakfast like pancakes or waffles on Saturday mornings. 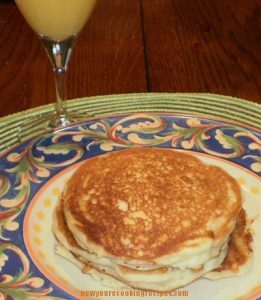 And I had this great recipe for fluffy buttermilk pancakes that we loved. After going gluten-free, my first few attempts at pancakes were pretty miserable, and I thought Saturday morning pancakes were a thing of the past. 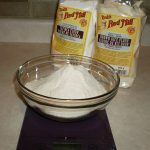 Then I tried my great recipe with the great all purpose flour blend – and fluffy buttermilk pancakes are once again on the Saturday morning breakfast table. In medium bowl, whisk together flour, sugar, baking soda and baking powder. In another bowl, or 2 cup measuring cup, whisk together egg, buttermilk and oil. Add wet ingredients to dry and whisk together until smooth. 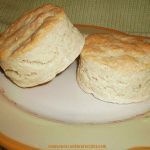 Allow batter to sit for 20 to 30 minutes, to allow the flour to absorb moisture. Preheat your griddle or large frying pan. I use a non-stick griddle and spray it with non-stick spray. 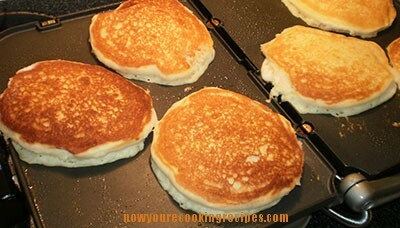 Drop batter (about ¼ cup per pancake) onto hot griddle. Cook until browned on the bottom. Flip over and cook on the other side until brown. Serve with butter and maple syrup, or your choice of toppings. 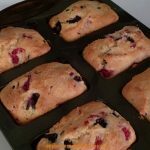 To make these with regular wheat flour, replace the gluten-free flour with all purpose flour, and eliminate the standing time.